Four hundred years ago this year, a ship from the East India Company from Britain reached Japan. It was carrying a telescope and other precious gifts from King James for the Shogun who in turn sent back gifts including two suits of armour (that are still preserved intact) and ten magnificent painted screens. The voyage marked the inception of what has become one of the most surprising and fruitful relationships in the world, between Britain and Japan. Remarkably, the influence from this first contact can be felt today in both countries, in industry, home and high street. I have had my tickets booked for Anjin at Sadler’s Wells since I first heard about it, but I had no idea it was part of a wider celebration. Japanese history is something I find fascinating, but have never formally studied. In particular, the period when Japan began opening its doors and trading with foreign countries intrigues me. In 1613, the English captain John Saris was invited to Japan by William Adams (who had arrived in Japan in 1600), and they travelled together to meet with Tokugawa Ieyasu in Shizuoka. After meeting with Ieyasu, they travelled to Edo (now Tokyo) to meet with Ieyasu’s son, Hidetada. Hidetada gave Saris the two suits of armour for King James I, mentioned above, which are now housed in the Tower of London. It was during this trip that Ieyasu gave Adams and Saris a Red Seal permit, allowing them ‘free licence to abide, buy, sell and barter’ in Japan. Another reason I like to think about this part of history is because it was a time of voyages and real adventure. There was no Internet, no mobile phones, and no idea what lay beyond the horizon. John Saris’ voyage to Japan actually began in 1611, but he didn’t arrive in Japan until 1613 – that’s two years of sailing around the world! Just imagine the things he must have seen, the people he met as he stopped along the way. You can read more about Saris’ voyage here on the Japan400 website, which is a nice site explaining about the 400 year history of Japan-British relations, and about the events which will be taking place this year. As I mentioned above, I’m already excited about Anjin: the Shogun and the English Samurai, which is on at Sadler’s Wells Theatre from 31st January – 9th February. Anjin is the story of William Adams, the ‘blue-eyed samurai’, known in Japanese as ‘Anjin’, meaning ‘pilot’ (he was a maritime pilot). Soon after Adams’ arrival in Japan, he became a trusted advisor to the Shogun, Tokugawa Ieyasu. But with clashes of culture and struggles for power, Adams was forced to decide who he really was, and where he really belonged. Anjin was originally presented in Japan in 2009 to mark the 50th anniversary of leading Japanese entertainment company HoriPro Inc. This new production stars Japanese actor Masachika Ichimura as Tokugawa Ieyasu and Stephen Boxer in the title role. 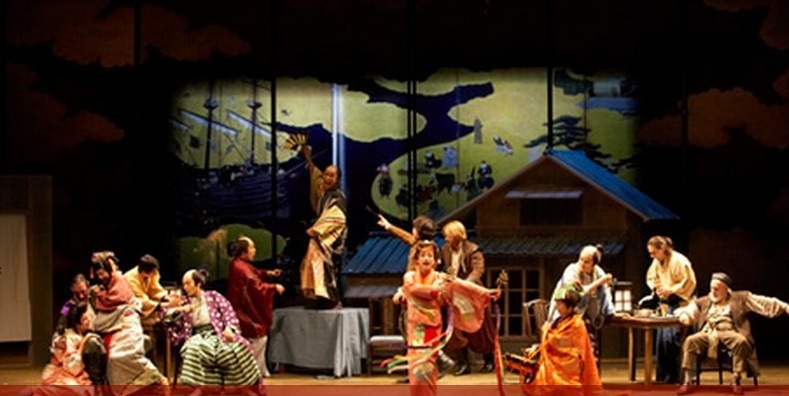 The play is performed in English, with Japanese surtitles. As well as Anjin, there are lots of other talks and events relating to this 400th anniversary coming up throughout the year. The Japan400 website has a list of events, which will be kept up-to-date as more are announced. Although I would love to, I couldn’t possibly attend them all, but perhaps some of you who are also in the UK will find something of interest. Check out japan400.com for more about the 400th anniversary of Japan-British relations. Thanks for posting about this! I’m also going to see Anjin but didn’t realise it was part of a wider thing. Same here – It wasn’t until I saw this in the news this week: http://www.japantimes.co.jp/text/nn20130118f1.html that I heard about it!